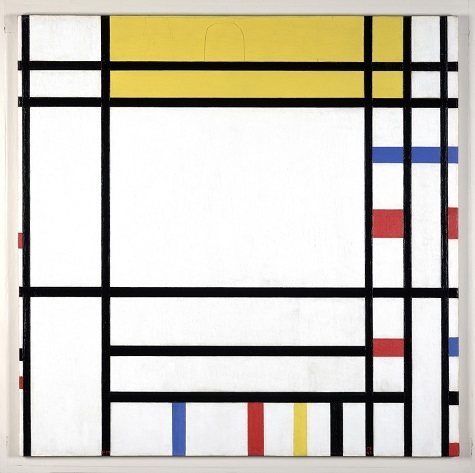 The abstract paintings of Dutch artist Piet Mondrian have become ubiquitous in pop culture, from architecture to designer fashions. In a sense his geometric, primary-colored compositions have become a brand. This proliferation and appropriation of an artistic style begs the question, what shapes an artist’s legacy? Why do some works of art become so intertwined with pop culture that they become icons instantly recognizable to mass audiences? Join us on Thursday, April 27 at 7:00 p.m. for The Mondrian Brand and hear from Dr. Nancy Troy, Victoria and Roger Sant Professor in Art at Stanford University and author of The Afterlife of Piet Mondrian. 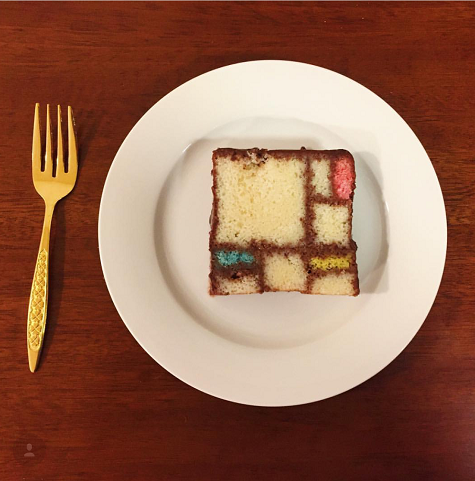 To contemplate Mondrian’s pop culture legacy in my own way I thought it was finally time to attempt the complex and beautiful Mondrian Cake made famous by Caitlin Freeman in her book Modern Art Desserts: Recipes for Cakes, Cookies, Confections, and Frozen Treats Based on Iconic Works of Art. To begin, I had to make four velvety cakes: one white, one blue, one red, and one yellow. Freeman uses a delicious recipe with a shocking butter content (I made two trips to the store). As you might imagine, I ended up with a rainbow of leftover cake that I was too lazy to repurpose into another dessert. After precisely cutting each section of the Mondrianesque composition I glued them together with 24 oz of bittersweet chocolate ganache and finished the cake with a shower of ganache. With two days of cake construction behind me I was impatient to see the finished product and did not let it set up in the fridge for the recommended three hours. Each slice revealed a mini Mondrian, if only slightly wonky and Easter-egg colored. We’ll never know if Mondrian would have approved of this culinary counterfeit, but I was certainly satisfied with my effort.